With Apple Watch pre-orders set to go live this Friday, April 10 at 12:01AM PDT (3AM EDT), the iPhone maker’s marketing continues to roll out. The company has provided celebrity Pharrell with an Apple Watch Edition, which he prominently showed off on his Instagram account. 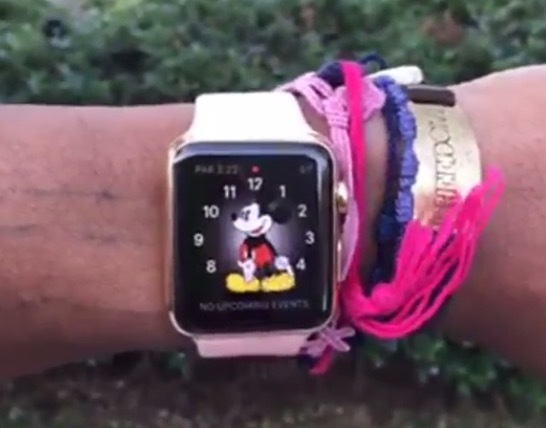 According to the video below, Pharrell flips his wrist up which shows Apple Watch automatically turning on its screen, revealing the musician’s choice of the classic Mickey Mouse watch face. The video appears to showcase a 38mm or 42mm Apple Watch Edition with Sport band (in white?). Pharrell also was seen wearing Apple Watch last night on NBC’s The Voice, which gets millions of TV viewers, and where the artist is one of the judges. Apple has started showcasing Apple Watch in a variety of magazines, including recently in Canada, landing on the front cover of Rogers Media’s Flare. When the original iPhone was announced, Shaq told a story of how he called Steve Jobs every other day to ask for an iPhone, to which the Apple co-founder repeatedly said “I can’t,” to deny the future NBA Hall of Famer early access to the company’s first smartphone. With Apple Watch, it looks like Pharrell gets to be one of the first celebrities to receive the smartwatch before its April 24 launch. I wonder if he called Tim Cook every other day asking for a watch? Probably not. I’m guessing Apple’s Beats Music boss, Jimmy Iovine, provided a hook up with Pharrell to show off the wearable. The musician was one of the first celebrities Iovine approached to check out prototypes of the original Beats headphones.